Upon arriving, Stuart - renamed Peter Sam - had many adventures. One of his more notable story arcs involved his funnel, which was severely damaged after an accident at the incline. The funnel eventually fell off as he passed under a tunnel and it was temporarily replaced with a rusty pipe. 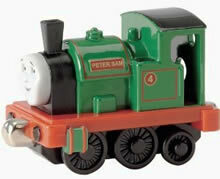 Peter Sam was soon given a new funnel, a Giesl ejector, which suits him much better.